After teasing to fire without really doing so in three games, Steven Smith finally turned up at Jaipur on a slow wicket to anchor Rajasthan's innings against a battalion of spinners and some shrewd captaincy from Dinesh Karthik. The Australian had made scores of 20, 28 and 38 in the three matches he batted in, but hadn't really been impactful until he turned up at the fall of the first wicket against Kolkata and took control of the innings. A feature of Smith's innings was how he kept the scoreboard ticking even when boundaries weren't coming along. With the sluggish wicket and Kolkata's spinners ruining Rajasthan's surge, Smith chose to relieve pressure off Jos Buttler and played as much of an aggressor role as his partner. The focus was on not losing wickets in the middle overs and to build enough firepower for the death. It wouldn't have been easy for a new batsman coming in to fire on this wicket and Smith knew it. When Buttler was dismissed, Smith was on 32 off 30 balls, fully aware of how his task was going to change in the back end of the innings. Tripathi and Stokes struggled after they failed to adjust to the slowness in the wicket, but Smith seemed to have anticipated that. He was slowly moving into fourth and fifth gears, and his half-century, his first since 2017, came in 44 balls. Smith soon changed gears but was watchful to still not throw it away. He made 23 runs in the last 15 balls and ended on 73 off 59 balls with seven fours and a six. Smith played the role of an anchor fairly well but the problem was that there was no aggression from the other end. Buttler made only 37 off 34, Rahane fell for 5, while Tripathi (6 off 8) and Stokes (7 off 14) struggled on a slow surface. The problem for Rajasthan is that they have too many batsmen playing the Smith role - anchoring the innings. Smith's return to Rajasthan was much less celebrated compared to that of David Warner. Widely acknowledged as one of the best Test batsmen in the world, Smith's craftsmanship and adaptability often goes underrated in the shortest format. He had been a spectacular player for Rising Pune Supergiant in the two years before the ball tampering ban which saw him miss out in 2018. In 2016, Smith scored a ton and made 270 runs at an average of 45 and a welcome strike rate of 153.4. The strike rate dropped in 2017 to 122.96 but he made more than 400 runs for the first time in his IPL career. He had last made 300-plus runs in his debut season in 2012. 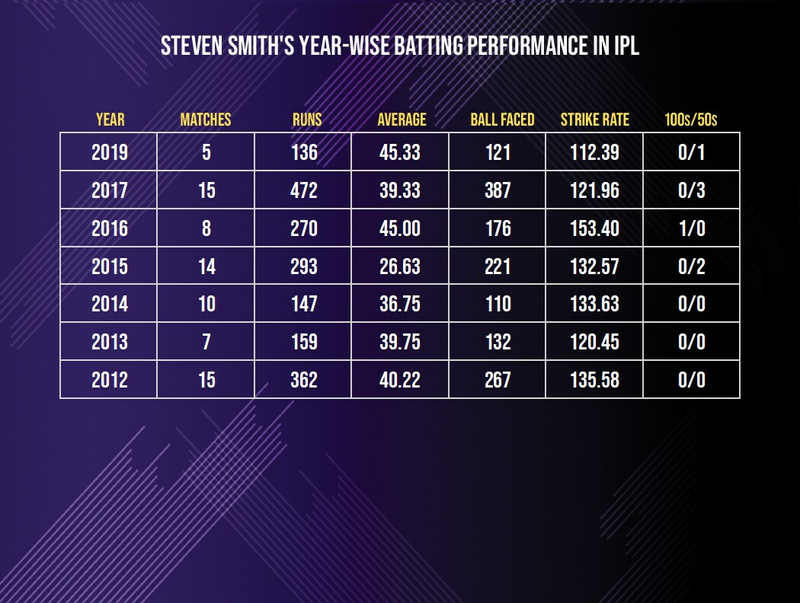 It took him four years to make a maiden half-century in the IPL but from 2016, Smith was a changed player. In the last three seasons he has played in the league, Smith has made runs at an average greater than 35 every time. This year, after five matches, his average is a commendable 45.33. The wickets he has played on has contributed to a slow strike rate but expect Smith to turn that around soon. With Sanju Samson injured, Rahane out of form and Ben Stokes appearing out of touch with the bat, Smith's rhythm is crucial to Rajasthan's chances this season. He has found his groove and it's up to him to build on this and turn around the fortunes of the franchise.